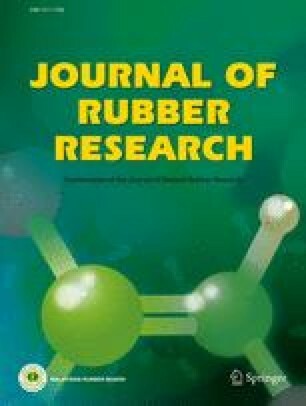 In the present study hybrid NBR/chitosan/nano-silanised silica blends were prepared by melt blending for utilisation of chitosan (the second most abundant biopolymer) in development of green rubber products. The non-reinforcing nature of chitosan was improved by addition of nano-silanised silica. The effect of nano-silanised silica loading on crosslink density, tensile properties, surface hardness, tear strength, abrasion resistance and morphology of blends was studied. Improvement in both mechanical and morphological properties of NBR-chitosan blends was observed upon addition of nano-silanised silica. FTIR analysis was also carried out to study the interaction between rubber phase and chitosan as a result of compatibilisation by nano-silanised silica.